Are we buying or selling? The interview room: Youkilis, Robert Parker, Johnny Pesky, Daubach, Leigh Montville, more. "The Internet geeks are getting all the interviews"
Contents Copyright 2001-2004 Boston Dirt Dogs, except logos used in accordance with the Fair Use provision (section 107) of U.S. Copyright Act. Photographic images posted with permission of Associated Press unless otherwise indicated. "...just give me a second..."
Pressure, relief too much for Dan to bear as he breaks down after detailing history, thanking club, family, friends, and fans for supporting him. Free at last, free at last, thank Bud almighty, we're free at last. Darkness at Noon for Duke. "A shapeless figure bent over him, he smelt the fresh leather of the revolver belt; but what insignia did the figure wear on the sleeves and shoulder straps of its uniform--and in whose name did it raise the dark pistol barrel? A second, smashing blow hit him on the ear. Then all became quiet. There was the sea again with its sounds. A wave slowly lifted him up. It came from afar and traveled sedately on, a shrug of eternity. Lucchino passes on vote of confidence. Manager change is in the air. Will Joe stay as pitching coach for now? Felipe Alou, Grady Little, and Jim Fregosi in the on deck circle. Law not on Duke's Side as There's a New Sheriff in Town. Dan denies hiring a new lawyer to prevent firing and keeps playing it cool in Fort Myers (although he shuttled back to Boston yesterday). Duquette called the legal report ''false, totally untrue... as far as I'm concerned, the Boston Red Sox have always treated me fairly, and I know that Mr. Henry is a gentleman, and I know he will treat me fairly. Furthermore, I am looking forward to working with him and his group to accomplish the goals of the team.'' Problem is the goal of the team is to send him packing on Thursday when Lucchino lays down the law. Trot's Not Dogging Manny "I am not going to sit here and dog any of my teammates. It sickens me to think people on the radio may think I'm stirring up stuff in the clubhouse... what I said from Day 1 is, the only person who has an answer for that is Manny or Joe Kerrigan. I'm trying to be positive, I don't want to be some bad guy." Rickey's spicy mustard may help us relish a World Series win. Trot steps up, speaks out for team, won't let IronManny forget it's a new ballgame this year. "You want to know why the Yankees win so many championships? Because everybody shows up ready to play baseball." The dog ate his Doctors appointment again as the uncomfortable one starts how he finished. "We're gonna give The Babe a shot of tequila and take it to the next level. We have the team to do it. It's going to be a fun year." Garciaparra is good to go. There's no stopping superstar shortstop. Duke not expected to remain in the organization after closing. The skinny on Garces is that The Thin One is down 35 to 240. Still has his parking spot and expects to be the General Manager after closing. Throwers report to camp today. Duke: "Best team since I've been here." Pedro loves pitching again: "It's not where we finished, it's where we'll start"
Rickey Henderson expected to accept Sox offer today. Is pumped-up Pedro arriving in Fort Myers today? Equipment van makes the trip from Fenway to Fort Myers today. Rickey may be in camp before Pedro. Pedro not in camp one week early. Out shopping for birthday candles? Will new and improved starter make it to Fort Myers one week early as promised? Improving chemistry? Following the Patriots footsteps? Sox have 43-year-old Ricky Henderson on the radar screen. And Gary DiSarcina. Tony Gwynn next? Life after Pokey leaves Offerman, Baerga, Veras, and Merloni. In-shape Jose should get the nod. Slimmed-down reliever gets another one-year deal ($2.2m). City celebrates first championship since "Moses eats you-know-what." What learnings will the new Red Sox take from their football brethren? Underdog Patriots bring New England first championship in 16 years on 'Adam and Leave' field goal. After 16 years, will tonight be sweet? Patriots hope to bring Greater Boston first championship title since Celtic win in '86. Duke sees his shadow. Six more weeks. Like the movie 'Groundhog Day', Duquette gets ready for Fort Myers for the ninth year in a row. The 2001 combined salaries of Bitchette, O'Leary, Valentin and Lansing (with buyouts), all of whom could only get minor league deals in 2002. Thanks Dan. Two $360s and a 180˚. Two bids for $360m are in and the waiting game begins. Who got scared off? Bids are in as Harrington holds the envelopes up to the lights today. Werner-Lucchino PR machine firing on all cylinders right down to the wire. Harrington says final decision on new owners could take weeks. But can the 2002 team afford to wait? Ding Dong! The Duke is Done. Which old Duke? The Wicked Duke! Ding Dong! The Wicked Duke is done. But who will be the next GM? And where will Katie sit? Is El Tiante coming back to light up the Sox? Will he be the fourth starter or a Pedro mentor? Will the Sox win it all in 2002 or will it be close, but no cigar? They can't come home again (it never works). Don't sign Sele (he can't take the heat). Don't bid on Buford (been there, done that, never liked the t-shirt). And don't even mention free agents Jeff Frye, Pat Rapp, or Luis Alicea. Dare to say yes to some new Fenway faces. Spaceman Still Out of this World. Former Sox southpaw Bill Lee says Pedro never recovered from a cartwheel in Cleveland in '99, now needs minor surgery. The Dirt Dog Hall of Famer also says Garciaparra's fidgeting draws attention to his wrists, that's why he got hit. What's he smokin'? We're Gonna Party Like It's 1999. Butch Huskey, and Mark Portugal next? Duke: Party over, oops, you're out of time. Let's Be Thankful (and a little hopeful). We've still got the Red Sox to kick around. Lots of changes abound. Nomar's wrist is sound. Pedro will soon be on the mound. Jason is working like a hound. A new owner will be found. A new stadium will break ground. You Can't Turn Back the Clark. But you can wind him up again. Lingering injuries to back, wrist, shoulder, ribs gives Tony a prime bed in the Mish-M*A*S*H unit. Let's hope time heals all wounds for spring. And that the price was right for the Tall Dog Tony. Who's the Sox Secret Agent Man? Bret Boone, Moises Alou, Chan Ho Park? Giambi mission impossible as Yankees will offer Jason $17 million for 7 years. Binding Bids for the Olde Towne Team are due at Fenway by end of month. It will be tough. Like me trying to get a date with Demi Moore. Former Sox star is set to become hitting coach. What's next? Yaz, Freddie Lynn, and Dave Henderson also coming back in effort to return to glory days? After record attendance, revenue, and injuries in 2001, Sox won't spend $110 million to field team in 2002. Duke will gamble that injured players return healthy. And while payroll will drop, ticket prices may go up. Four strikes and you're out? Should Sox keep Carl? Market is missing for $17.15m cantankerous center fielder. No more Nomo? Yes and No. Herald says no rush for Hideo. Globe says deal almost a go. Big Mac gets old. Big Unit gets Young. McGwire to retire. Randy wraps up Cy. 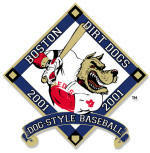 New England Turf Dogs go over .500 for first time since '99. But skies are Gray as Patriots' "Big Dog" passes away. Boston College 11 is Green with envy as Miami's miracle ends hopes of #1 upset. Ownership, free agent activity picks up steam next week. Is there a Bret Boone or Cliff Floyd on the horizon? 100 Days 'till Spring Training. Short on time, long on changes for Sox, Baseball. It's official. Larry joins Werner/Otten team. Binding bids due soon. Au Revoir. See you later Alligator? Are Montreal, America's Farm Team, and Florida, one-shot World Series wonders, gone? Or is it a Twin killing? Terry Glenn fills it for the Patriots. In other depressing news, George already going after Giambi and will probably get him. Sox handcuffed by sale, Harrington. Rivera rattled in 9th. The Yankees Lose. Theeeee Yankees Lose. Despite Bremly's blunders, D-Backs come back to win Game 7 in last at-bat. Long-suffering Arizona fans can finally celebrate their elusive World Series championship after an unbearable, unfathomable four year wait. The Yankee dynasty has come to an end. Let the Hot Stove season begin. O'Leary Era Over. Valentin Days Done. Thanks Johnny V. for a great '95, '98, and especially '99 playoffs. "Waaay baaack, Grand Slam, Troy-O'-Leary", another big stick in '99, stick-in-the-mud since. Goodness Brosius! D-Backs to the wall after leaving D'Bronx. Tino's big blow ties it up. Mr. November nails it down. Schilling bet backfires. Yankees win another come-from-behind game. Shades of a Red Sox World Series Game Six: Martinez-Jeter saved the day like Carbo-Fisk in '75. Arizona's Brenly-Schilling-Kim gave it away like McNamara-Clemens-Schiraldi in '86. ...after being lost for days on the road. Sit on bases to the bitter end. Now the last stand begins. Can they rise against Roger? The Dirt Dogs only friend, the end. Getting eerie feelings from Lake Erie. Dogs lie down, roll over for Tribe. Left for dead in the Flats of Cleveland. No Nomar, No chance. 33 games left to play. Plenty of time, but no time to lose. Jacobs ...Field of Dreams? Arlington road is a dead end. Still dog-tired from all-nighter, Sox stumble out of Dodge. Oh and The Mound Dog returned (sort of). Achy Breaky Heartbreaker ends as Sox can't get to 19, 18 ends it. Big Hassle, but Sun also rises. O Nomar, Manny, wherefore art thou? Deny thy Nation and refuse thy game? How you feelin'? TROT! trot! trot! Ugueth it! Sox rally to beat bad Rapp, Angels. Troy, K-9, Belli Huge. dogs BACK IN THE HUNT! Miribelli was full (after dinner). And so were the bases when he crushed it. Sweep the Angels right back. What the hell. dogs still have some bite left. won't roll over, play dead. dogs leg left (COAST). tAIL BETWEEN lEGS. Is this the end for Manny's Best Friends? And make it a double... triple... home run. These birds are pigeons. The bats will come alive during the day. MIGHTY CASEY WILL JUST STRIKE THEM OUT. Best of luck to the Fos Hound today. Hunt down those birds like a cat. And click here to read Ernest Lawrence Thayer's Casey at the Bat. EVERY DOG HAS HIS DAY. cONGRATULATIONS jOE k.
We're with you all the way... to October. Dogs get off on the right paw. DON'T LET ALICE SELE BEAT YOU LIKE A DOG. Salvage the last game. Send gutless Alice, Seattle a message. Scratch him! Bite him if you have to! Let's go Fenway Frank. The Nation turns its lonely eyes to you. Nomo gettin' lucky for M's, Moyer. Sox Southpaw Slump ends. Seattle slew of losses begins. Good news: The Mound Dog looked strong in his 60-pitch workout Saturday. Very bad news: TekDog, who embodies the spirit of the Dirt Dogs like no other, is lost. DOGS IN THE CAT BIRD SEAT? Let's see if they can control Towers today. And so does the back-and-forth sweep streak. Here's hoping there's one more sweep in our favor. Let the Dogs out in the Yards this weekend (but can't send them out on a night like this). BALL IN A CUP? time for a cone. The A's have it, while the Dogs (jet) lag behind. And old Sabes new tricks were just smoke and mirrors. Another must win this afternoon for the new old dog... the unstoppable, unflappable David Cone. Dogs still can't get lefties right. But SouthPaw Pulse was crafty, nasty; Spike filled in nice; and Trot was tops again. And I relish the thought of Fenway Frank pouring on the mustard tonight. Life is Grand. Let's take the East before coming back from the West. SWEEP THROUGH THE HEART OF TEXAS. Nomo wild card talk. Let's focus on first! SPIKE AND TROY TAKE A BOW...WOW. Sox take two! Rolandog does bite today. And let the winning streak continue. It WAS Raining Cats and Dirt Dogs. So "let's win two" today. And let the winning streak continue. Wake Don’t LET THESE SLEEPING DOGS LIE. Let’s mess with Texas on Friday. And let the winning streak begin. Let's go sabes. Old Dog, New Tricks. They have to win tonight. I'm going to the game with my dad. UGUETH IT! sOX GET uRBINA. But are bedeviled by Angels. Fear not, the Dog Days of Summer are upon us today. Will Brady's Bunch show some punch? having pre-game meeting today. Look out Tigers. Just playing out the string. And stringing us along. is only five months away. Was that Jimy talking? Something's rotten in Denmark... and at Fenway. Not-such-an-Iron-Manny misses Cal's last stand and the final home game. That's the thanks we get for showing up in record numbers. Nice farewell. Dan's Marionette PinocciJoe said: "...these fans are really proud of their team." Huh? needs at least a High Holy Month to reflect on their sins. I Trust they won't be back at Fenway after tonight. Wait 'till next year's litter. It's official (but well known since The Texas Mess on August 25th). they've been barking up the wrong tree. Kerrigan blames 'eavesdropping' (Edesdropping?) media for Sox woes. Promises to keep all of us less informed next year. Thankfully we can get all the news we need from redsox.com... no thanks. You too Drew? O'Leary and Bledsoe drew blood, sweat. Tears for the rest of us. Do we now look to the hapless Bruins or Celtics to get us to Spring Training? Or only focus on the real heroes heading to war? 'The Truth' was stranger than fiction. But it's the end of the line for Everett. The chapter on Carl is closed. and Carl can't come home, again. What Carl said about Joe... just say it ain't so. And Martinez was mad and had to go. Manny is sad... wants to bail out as well. Cal rips one out. But is he Mo Vaughn or Sam Horn? Carl on the way out. Kick him to the curb if you have to. El Guapo Flips, Flops. Reality Bites. Time to put Dogs to sleep until next year. And here's hoping Carl's time is up. The real Truth: Oakland 30 games over .500, Sox are only three over... and out. Baseball is back, as we must go forth. and makes an appearance. Will he speak soon? But hate Carl "The Truth Hurts" Everett. And where-oh-where is John-Gone Harrington? Where-oh-where can he be? And ship him out of town with Duquette. No excuse acceptable for the latest Mt. Everett eruption. Fly your flag high until justice has been served. We will resume baseball-related activity on Monday. Please conduct a personal moment of silence for the innocent victims lost in this tragedy. slip sliding away, you know the nearer your destination, the more you slip sliding away... we're workin' our jobs, collect our pay. Believe we're gliding down the highway, when in fact we're slip sliding away"
Like the old 'new economy', Dogs may not have hit rock bottom yet. Let's just call it Fall Spring Training for 2002. And let's Go Pats. We need something to cheer about today. ...is the new battle-cry for September after Bronx tale turns into same old story at the plate. The Mound Dog is sick. The Old Dog retires. The Dirt Dogs are mad. Indians collar Dogs again. Worst-case scenario, a.k.a., football season, is here. Stifled by another old southpaw, late rally falls short. 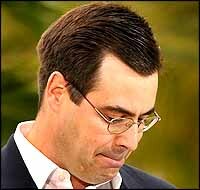 Short-sighted Duquette, still hanging on by a thread. Trot comes through. Bad stretch over. Are Dogs finished? but does Duke get the message? Harrington remains hidden. and counting. And The Nation is also counting on a Duke resignation by the end of the week. Give it up Dan, the double-talk days are over. Time to move on. Mike Port, your ship has come in. John Harrington: sell, sell, sell. Duke chases his own tail. But can't cover it any longer. Dogs need a new owner and a fresh start in April. Let's pick up after this pack... then put them to sleep. Driving us to drink after sobering weekend. Duke, the straw that stirs this sour cocktail, has no one left to blame. John Harrington, last seen at the BC 40-yard-line, remains on the sideline. Last call John. Game's over. Sell the team. Go home. and if the Dirt Dogs are left in the fight." Well Bob Lobel, the answer my friend isn't blowin' in the wind anymore. Put away the 'Panic Button', bring out the zipper... and close up the body bag. Fenway Frank was not done, still had plenty of mustard on the ball. But Dogs cooked in 8th as Yanks catch-up. Stick a fork in 'em, they're done now. The “Curt’s Pitch for ALS” program is a joint effort by Curt and Shonda Schilling, and The ALS Association Mass Chapter to strike out Amyotrophic Lateral Sclerosis, more commonly known as Lou Gehrig’s Disease. Curt and Shonda will be contributing $25,000 to The ALS Association Massachusetts Chapter, and they are asking fans to contribute as well. All proceeds will benefit research and patient services for those in Massachusetts affected by the disease. Program participants will receive different incentive prizes based on the dollar amount per strikeout that they pledge. Please click here to learn more about the program. The Curt and Shonda Schilling Melanoma Foundation of America welcomes Red Sox Nation to join in their fight to save future generations from melanoma, a potentially preventable skin cancer.